Welcome to the 47th edition of the Carnival of Divided Government - The Special "Beware the Ides of March" Edition. "Beware" indeed. It is easy to overreact to the seemingly unending signs and portents of catastrophic disaster that surround us. But when you think about it, what do we really have to worry about besides revolution, war, earthquakes, tsunamis, nuclear meltdowns, radioactive fallout, U.S. government insolvency, a stock market collapse and Charlie Sheen? I mean, other than that, it's all good. Time to check in on our happily divided government and see how it is dealing with the stress. As explained in earlier editions, we have adopted Latin ordinal numeration to impart a patina of gravitas reflecting the historical importance of the series. In this the Carnival of Divided Government Septem et Quadrâgintâ (XLVII), as in all of the CODGOV editions, we select volunteers and draftees from the blogosphere and main stream media writing on the single topic of government divided between the major parties (leaving it to the reader to sort out volunteers from draftees). Consistent with this topic, the primary criteria for acceptance in the carnival is to explicitly use the words and/or concept of "divided government" in submitted posts. A criteria that, to our endless befuddlement, is ignored by many of the bloggers submitting posts, which sadly results in The Dividist reluctantly ignoring their fine submissions. Among the on-topic posts, essays and articles we choose our top ten favorites for commentary and consideration. We hope you enjoy these selections, and have an adequate supply of potassium iodide tablets close at hand. The Dividist is not quite finished with that particular Centrist discussion, as Mr. Kleinsworth still fails to understand that the existence of polling data for centrist policies does not prove anything about the practical political utility of flogging the dead horse centrist electorate he is imploring to "rise up". 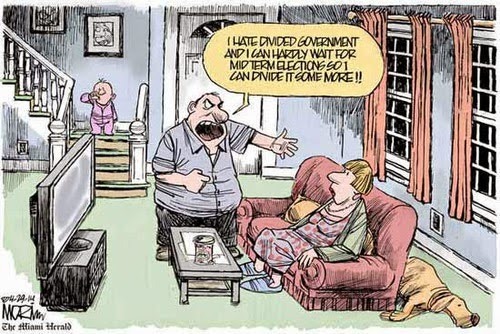 Still the Dividist appreciated the divided government commentary this discussion precipitated. But we're also seeing one of the benefits of divided government, that constructive compromise is essential to the success of legislation. The all-or-nothing approach is a sure loser. And we literally can't afford to delay action on dealing with the deficit and the debt." "If our commission was a test case for divided government, then we have offered resounding proof that the parties can work together for the good of the country. Our recommendations, which would reduce the deficit by $4 trillion, garnered support from 11 of 18 members (five Democrats, five Republicans and one independent). A 60 percent majority is enough to pass almost anything in Washington. Our commission's plan is not ideal from either party's perspective, and it is unrealistic to expect either side to endorse it in its entirety or as an opening bid. But if both sides are serious about achieving reform, not just scoring political points or ensuring reelection, they will realize that our plan, or something equally comprehensive, represents the type of principled compromise that is in the country's best interests. In the end, we are optimistic about the chances for fiscal reform and about the future of this country. The political system doesn't always move quickly or steadily, but the magnitude of the challenges ahead will require it to act. The nation desperately needs broad, bipartisan agreement based on shared sacrifices, not politics as usual. The fiscal commission's plan can serve as the starting point; the ending point must be something equally ambitious. Now is the moment of truth. The era of deficit denial is over. We are counting on our nation's leaders to rise to the challenge." Against all odds, the Dividist is optimistic that something meaningful will emerge from this process. I agree with Madison (see Federalists 10 and 51, of course) that majority-rules systems tend to be unstable. Parliamentary systems tend to deal with that in a few different ways. One is, as Yglesias says, by inserting another round of elite bargaining in order to form a government after the voters have had their say. Most parliamentary systems also have a strong bureaucracy that narrows the importance of the elected government. In my view, these devises (as well as corporatist arrangements, which are not necessarily related to parliamentary forms of government but do tend to go with them), are all ways of avoiding the instability of majority rule by weakening democracy." The Dividist appreciates Professor Bernstein's erudite rebuttal and defense of our divided and contentious Madisonian system. Additional ammunition against the peculiar preference of many on the left for an elite "expert" bureaucratic or majority rule is also offered by Professor Marcus Ethridge's recent work. "I still think the President’s best tack to propose some budget cuts for the preceding 2 reasons, and because to win big confrontations in a divided government you have to be able to “out-reasonable” the other side. That doesn’t mean you move as far to their position as you can; it means you take meaningful actions to render opposition criticisms obsolete–provided you can do that without abandoning core political objectives. " Good advice, and a good reason to keep our federal government divided. The Dividist is relieved to know that President Obama, Congress, and broadcasters holding government mandated monopolies on broadcast spectrum will, between them, decide for us what technology is best to deliver the latest Charlie Sheen late-night video rants to our iPhones. The Dividist wouldn't want to miss anything. Chuck Drury, writing at ABC Newspapers and presumably from Senate District 47 reminds us of how silly it is to rail against a lack of civility in US politics as if it is recent phenomena. It's not, as he shows us in "Politics has lacked civility from the beginning": "
"I personally am a fan of divided government. We seem to get the best results when our legislatures are of one party and the president or governors are of another. Single party rule leads to abuse of power and bad decisions. I have been more concerned about the recent lack of openness and transparency in the legislative process than I have about conflict and rancor in government. Spirited debate of the issues is a good thing! Too much power in one party leads to a detachment from the citizens they represent. This is borne out by the current difference in viewpoint between those of the political class and mainstream voters." "The years from 2006 through 2010, starting with the Democratic takeover of the House and ending with the party's rout after two years of Barack Obama's presidency, were four years of an effort by a know-it-all liberal elite to impose sweeping and extreme social and fiscal measures on a centrist-to-right public: four years of turkey escabeche, so to speak. Now, with a GOP House and divided government, there seems to be a return to normalcy, and it's beginning with the promise of knives and forks that work." Heh. I think even Washingtonian Democrats are happy that Nancy Pelosi and one party Democratic rule are no longer in charge of running the cafeteria. "In the absence of divided government there is little incentive to stretch beyond a majority supported compromise. So, in American politics, voters are left between insisting that government function with deals negotiated between the left and right in exchange for a risk a damaging deadlock, within divided government, and government by a right of center, or left of center consensus with little to encourage it to be inclusive." There is a lot to chew on in Andrew's piece, which should be read in full. Some the Dividist likes, some not so much. The Dividist does agree (mostly) with the conclusion quoted here, so he'll just pick a few nits and circle back. First a general comment - the Dividist has noticed a consistent and continuous grumbling from those who self-identify variously as centrist/independent/moderate (CIM's) to the effect that their "centrist" views are not reflected in the makeup of the federal government. This despite the fact that if you put any group of self-selecting CIM's into a discussion of any specific policy issue there is no more agreement than one finds in a discussion of the same policy issue among self-selecting partisans. Look at any "No-Labels" thread on any specific issue for confirmation. They only appear to agree as long specific policy issues are not discussed. Well - No-Labelists do agree on one thing - everyone should be more polite and civil. They aren't any more polite or civil themselves, they just agree that everyone else should be. Because there is this belief about a disenfranchised center, we get all kinds of sophisticated, convoluted explanations and proposed solutions to solve this problem - involving everything from open primaries,to proportional representation to wholesale constitutional changes to an oft-expressed preference for a parliamentary system where a 52% majority can run roughshod over a 48% minority in the name of "getting things done". Occam’s Razor -the proposition that a simpler answer is more often than not the correct answer - suggests that this widely held assumption of a disenfranchised center is false. The simple explanation for why our legislature seems evenly balanced and highly polarized is that it is, in fact, an accurate reflection of the electorate at large. Two studies support this notion that the true independent vote is smaller that generally believed - the 2009 Miller McCune piece which pulled on several threads to put the true Indy vote at around 15%, and a more recent Cato study which has tracked a Indy swing vote of about 14% through the elections of the 2000's. Lets be generous and put the Indy percentage at 20%. The point is this - there is no basis for a Centrist complaint, if the electorate is actually an evenly split 80% partisan, and 20% true Independent swing vote, with Centrists (whatever that means) being some smaller subset of the Independents. Which brings the Dividist back to Andrew's conclusion, with which in this context, the Dividist agrees (excepting Andrew's use of the word "dangerous" to describe gridlock). Far more dangerous, is sweeping legislation (Obamacare) or policy initiatives (Iraq War), which are enabled without broad super-majority support during periods of one party rule. 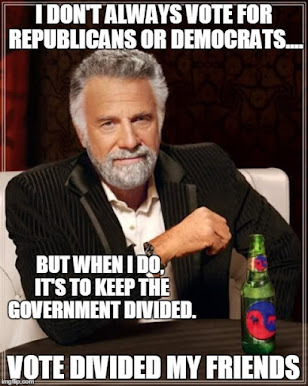 Independent voters have the power to insist that government function with deals negotiated between the left and right by always voting for divided government. Every time. Without exception. Divided government is not a bug. It's a feature. The Dividist is guessing that Jen Worthy of Worthy Thoughts is a middle school student who is using this blog as a resource for a homework assignment. The Dividist thinks this because she ripped a couple of the Dividist's graphics for her blog report, about which she says "This relates to class because divided government and gridlock were two of our vocabulary words and we took notes on it". A better rationale than anyone can discern for your typical PaulKrugman screed. In any case, she does not decide whether or not she likes divided government in her report entitled "Divided Government and Gridlock"
"A divided government can be good because it encourages more policing of those in power by the opposition, limits spending, and the expansion of undesirable laws. It also forces the two parties to get along so that they can be able to work with one another. Its an example of checks and balances." The Dividist is just happy to know that middle school teachers are including "divided government" and "gridlock" in their vocabulary class. The Dividist is also happy that Jenn got the definition and benefits right. The Dividist feels he is having an impact on the youth of America. For this edition, we offer Michael Wolf presenting. Letter 2 America for February 14, 2011 posted at letters2america, saying, "What is CPAC really after? Watch Social Security and Medicare and you'll find out." I agree with almost nothing Michael says here, it is mostly partisan pablum, but at least it is not spam. Joshua Pundit of The Watcher's Council presents the "Watchers Council Nominations - Shaken and Stirred Edition" at Watcher of Weasels, featuring an Honorable Mention for the Dividist Entry - "Jackass Journalism". Arohan presents "Carnival of Wealth" at Personal Dvidends. Andrew presents "CoTVing out of Wisconsin" at Dodgeblogium. With that, we'll conclude this edition, as we may still get this under the wire and actually posted on the Ides. Look for the next edition of The Carnival of Divided Government Octô et Quadrâgintâ (XLVIII) - Special Patriotic Tax Day Edition - on or about April 15th. Unless we don't get our taxes done, in which case Uncle Sam takes priority over the blog reader. Uncle Sam has guns. Submit your blog article at carnival of divided government using our carnival submission form. The Dividist has a small, even if well-armed, readership. The Feds have more and bigger guns. The Dividist will still do his taxes first.